Anyone who has heard Mariah Carey's dreadful cover version of 'Without you' in 1994 may have a hard time to ever listen to this song again without that traumatic experience on their minds. She released her version just a week after Harry Nilsson, who had a hit with it back in 1972, had died. I just pray that the poor man has never had to hear her version. Nilsson himself covered the track, because it was originally written by Pete Ham and Tom Evans of the rock group Badfinger. It appeared on their 1970 album 'No dice', but it wasn't released as a single. In parallel to the song lyrics, both Ham and Evans later committed suicide. 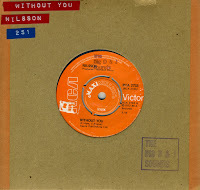 Nilsson recorded his version in 1972 on the album 'Nilsson Schmilsson'. It was a number 1 hit in the UK and peaked at number 10. Personally, I can't hear this song without getting goosebumps. Even after that horrible Carey version!